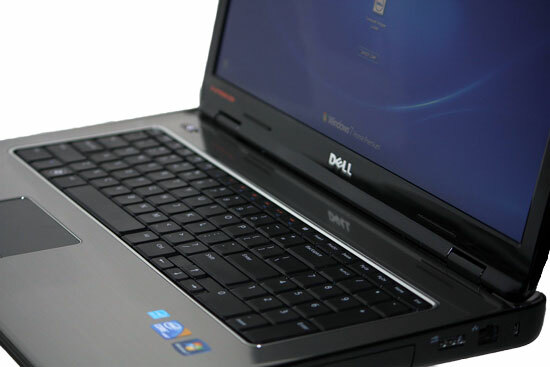 Dell’s flagship consumer notebook category continues to be a popular choice for those looking at a run-of-the-mill mid range Laptop setup. 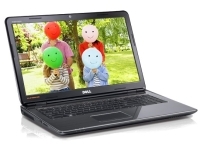 In this review and accompanying videos, we take a look at the largest in the Inspiron family. The 17 inch edition. Like all Desktop replacements, 17 inch notebooks are not built for their ease of carrying and moving around the house. You won’t be placing this in your backpack often and its not exactly an ideal choice to place on your fold out table on an airplane either. Their big, and built for those who need to literally replace their desktop machine but still want to occasionally take the machine to another location if the need arises. Owing to their large form factor, additional features can be found on these machines that would otherwise be absent from their smaller 15 and 13 inch cousins. One thing you’ll notice is the large full size keyboard complete with an numeric keypad. The Inspiron 17R is a joy to type on and features some quick launch keys, which allow for control of the Wifi, battery life, volume and display brightness. From the outside, the build quality isn’t bad either, considering its made of multiple parts, around the hinge the plastic has a slightly flimsy feel. When holding the machine in one hand (not something you’ll be doing for long) you can feel the frame of the computer move and collapse slightly on one side. However the machine feels sturdy and durable. But only years of use can really confirm that. The specs of the entry level 17 inch model we got our hands on are as follows. All for the incredibly competitive price of just €567. A bargain in our view. The inputs are as expected for such a notebook, on the left side 1 VGA, HDMI port, Ethernet, 2 USB ports, a large fan and vent beside the power port. On the right side you’ll find a microphone port, headphone jack, 2 more USB ports, sd/mmc port and a DVD drive. The trackpad is built into the aluminum part of the palm rest. Trackpads that are completely flush with the surface of any notebook can be hit and miss at times, although esthetically they can look quite nice, we don’t recommend you eat any marmalade sandwiches, while using it. Any sticky substances on ones fingers can result in an noticeable reduction in sensitivity of the trackpad. The display quality is only average, not the worst I’ve used but photography and graphic professionals will need to be aware that this is not the machine for gauging correct color. The viewing angle is poor as colors gradually become washed out when viewing the screen from any angle other than very straight on or something close to it. Similarly to the Dell Vostro I reviewed several years ago, cooling is a major issue. Do anything even remotely processor intensive, that includes flash videos like watching Youtube, the machine becomes very loud and very hot. The vent at the side frequently spews out hot air, so I wouldn’t be confident leaving the machine lying on a bed or soft surface that will absorb much heat. Although many will argue that you get what you pay for in this regard. It’s my view that at this stage, these affordable mid-range notebooks need to move on from these kinds of hang ups. The resultant temperature increase has a dramatic effect on system performance, which is a shame because it can often make direct benchmark comparisons more difficult when a PC is handicapped in this way. Windows 7 performs admirably, albeit with some proprietary Dell bloatware preinstalled, in the form of an annoying and largely redundant quick launch Dock at the top of the screen. We found this more of a hinderance than a help as you can accidentally click on it when attempting to type in a new URL address in Internet Explorer for example. Further more, Windows 7 already has a ‘Dock-like’ taskbar at the bottom of the screen, which allows you to pin applications to it so theres really no point having another extraneous UI application taking up valuable system run time and memory upon startup. Our recommendation is to head for the control panel and uninstall the application at your earliest convenience. Other than this small gripe, performance is snappy and responsive. Battery life estimates of 2.5 to 3 hours are surprisingly accurate for basic text editing and light Web surfing at low display brightness settings. However, Flash video, i.e YouTube or making use of the Media Centre, watching DVDs will probably give you a more modest 50 to 60 minutes at the most. Of course, being a desktop replacement Notebook you’ll probably have the machine plugged in at one location most of the time so battery life from a practical day-to-day use standpoint can be seen as a non issue. 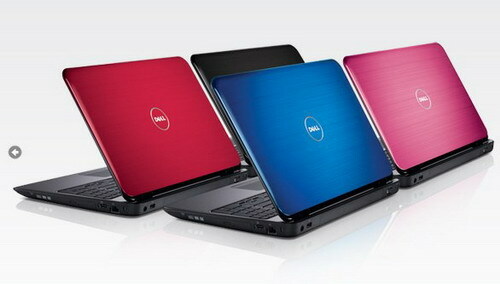 In conclusion, the Inspiron 17R makes for a solid work capable and media centre friendly notebook PC. Desktop replacements are not for everyones needs or tastes but are specific to a few who want the best of a desktop with the occasional mobility of a laptop. Despite some cooling issues and questionable build quality of some plastics used in the hinge system, any small issues could be considered nitpicking when looking at the price point. It’s a bargain machine with reasonable specifications. Plus who doesn’t love a choice of color options? What is your Web Browser and why?